This barber style open straight cut throat razor is very effect for achieving a close shave. The stylish handmade razor provides an exceptional quality shaving experience. The double hollow ground curved razor blade is made from German high quality carbon steel. 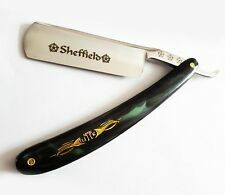 Want a close shave in the classic style than the straight razor is the only way to go. Blade will require honing by strop. Strop not included. However it is also the ritual of properly wet shaving that people enjoy. 3-Teiliges Rasur Set bestehend aus einem Rasiermesser, einem Aufbewahrungsetui und einer geraden Zupfpinzette aus Solingen. Dieses Bartpflege-Set ist Ideal geeignet für die traditionelle Rasur. 1 x Rasiermesser mit Hohlschliff, Goldätzung und einem schwarzen Klingenrücken. Der Hohlschliff ist bestens geeignet für Einsteiger. 5/8 Zoll Klingenbreite, Klingenlänge 7,0 cm, Klingenbreite ca. 2,1 cm. Echte Handarbeit. Normalstahl-Rasiermesser-Klinge, einfach nachzuschärfen. 1 x Gerade Zupfpinzette aus Solingen. Gesamtlänge 8 cm, Zupfbreite 5 mm. 1 x edles Aufbewahrungsetui zur sicheren Aufbewahrung des Rasiermessers. Zum Verschließen besitzt das Etui einen Druckknopf. Somit lässt sich das Rasiermesser sehr schnell verstauen. Die Maße des Etuis sind 17,5 cm x 4,5 cm im geschlossenen Zustand. This barber style open straight cut throat razor is very effect for achieving a close shave. The stylish handmade razor provides an exceptional quality shaving experience. The double hollow ground curved razor blade is made from high quality carbon steel. Pure Leather 4 Sided Strop for Sharping All Kind Of Blades & Razors. 4 SIDED LEATHER STICK STROP Genuine leather strap for sharpening and smoothing your razor blades. Original FACON BARBER SALON STRAIGHT CUT THROAT SHAVING RAZOR SHAVETTE RASOIRS RASOI BLADES. Indian WOODEN BLACK STRAIGHT RAZORS. 100 Blades. 1 X Swinglock BLACK Indian Wooden R azor. Blades are already single edge. 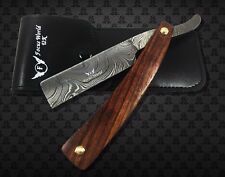 Sweeney Todd Straight Razor HUGE 11.5" Blade Barber Pocket Knife Shaving Demon. Sweeney Todd Demon Barber Straight Razor. Johnny Depp / Sweeney Todd Movie Replica. 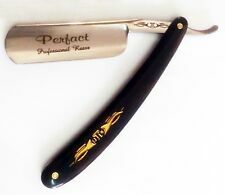 Nice Straight Razor Design! For safe reason the razor is not sharp enough. Pure Leather Two Sided Strop for Sharping All Kind Of Blades & Razors. SMALL LEATHER STICK STROP (TWO SIDED) Genuine leather strap for sharpening and smoothing your razor blades. Damascus Steel Razor Blade. 1095 Hand Forged Damascus. 264 layer. - Straight -Sharp. AGE RESTRICTION. DOUBLE SIDED LEATHER STROP IS PRODUCED FROM COW LEATHER. Professional Straight Cut Throat Shaving Razor. REAR SUEDE SIDE IS FOR SHARPENING AND FRONT PLAIN SIDE IS FOR HONING/SMOOTHING THE RAZORS. Razor Japanese Stainless Steel & Wood Handle. Da wird nur das Etui verkauft! von BÖKER MANUFAKTUR Solingen GERMANY. Straight razor, shave ready. Opened cleaned inside and out. I have built international reputation for the finest of edges and the quality of my work. Really great straight razor added to my collection. 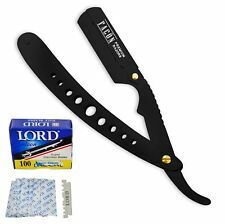 It is the best Razor for Barbers, Hair salon and for personal use also. Professional Straight Cut Throat Shaving Razor. Take a double edge razor blade & fold the sides upwards so the two blade edges bend towards each other. 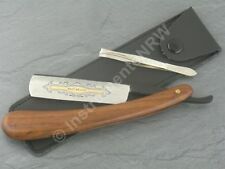 Straight razor shave ready, rare SORT AFTER VINTAGE FREDRIC REYNOLDS SHEFFIELD. I have built international reputation for the finest of edges and the quality of my work. Really great straight razor added to my collection. Shave ready as promised. If you have any doubt as to whether your razor is sharp, it isn't. Informationen über das Produkt Friseur schneiden Rasierer Griff Material: Rostfreier Stahl. Die Dauer der Überweisung hängt von der verwendeten Bank ab. WITH SILVERY WHITE ITALIAN DESIGNED SCALES GIVES A COMFORTABLE AND WELL BALANCED RAZOR. THIS RAZOR IS SHAVE READY AND JUST REQUIRES ROUTINE STROPPING. THIS RAZOR WILL MAKE A FANTASTIC PRESENT. THE BLADE IS MADE FROM HIGH GRADE CARBON STEEL TO ROCKWELL HARDNESS 58-60 GIVING GOOD EDGE HOLDING. Klinge und Griff sind aus rostfreiem 440er Stahl gefertigt und mit einem attraktiven Dekor versehen. Klinge 12,3 cm. Stärke 4,5 mm. Nicht wie erwartet?. Kein Problem, wir finden eine Lösung! Pflege und Wellness. Professional Straight Cut Throat Shaving Razor in Multi Titanium Coating. Very sharp for smooth shave. THE SIZE OF THESE PADDLES MAKE THEM SUITABLE PARTICULARLY FOR SMALLER BLADES. FRONT SIDE HAS SMOOTH FINISH LEATHER AND REAR SIDE HAS SLIGHTLY ROUGH FINISH. PERFECT FOR SHARPENING AND SMOOTHING THE CUTTING EDGE OF SHAVING RAZORS, KNIVES AND OTHER SHARP EDGE TOOLS. 2 X TURKISH CUT THROAT RAZOR BARBER SUPPLIES WET SHAVE. 2 x Professional Turkish Cut Throat Razor. Barber Salon Straight Cut Throat Shaving Razor Shavette RASOIRS RASOI 10 Blades. These razors are made with hand produced steel with handle. Sharp Stainless Steel Blade, Easy And Quick To Shave Beards. Made from the superior cowhide. This leather strop features a hook/swivel loop which allows the strop to be attached to a range of hanging points while maintaining the flatness required for perfect stropping. 2 x Professional Turkish Cut Throat Razor Shavette style open razor which takes single edge or half a standard sized double edge safety razor blade (sold seperately) Please note - this item is designed for professional use. For your own safety, please do not purchase one unless you know how to use this style of razor. Cutthroat razors are available in Most colours Please enquire before purchase ing. Straight Shaving Razor. Professional Straight Razor. Feel confident buying from Super-shave. Ideal for Shaving & Beard. Razor take regular single edge disposable blade. Rasierseifenschale aus Edelstahl mit Deckel. Die Rasierseifenschale besteht aus rotfreiem Edelstahl. Die Manufaktur Thiers Issard kann auf eine sehr lange Tradition zurückblicken. Der Deckel schließt nicht luftdicht ab, so kann die Seife trocknen ohne zu verschmutzen. Von Herold Solingen. - Tubenpaste GELB für Leder -. 100% HAND MADE in Solingen GERMANY. 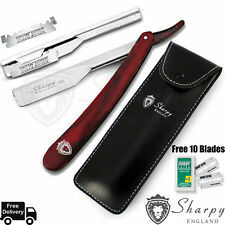 Barber Salon Straight Cut Throat Shaving Razor Shavette RASOIRS RASOI 10 Blades. These razors are made with hand produced steel with wood handle. Sharp Stainless Steel Blade, Easy And Quick To Shave Beards.